I remember having a lovely lunch in a restaurant by Fisherman’s Warf in San Fransisco. Everything was perfect: wonderful view of the ocean, sterling service and then I felt a crunch of sand in the spinach Florentine. How could such a high caliber kitchen fail to thoroughly wash those greens? It happened years ago but I remember it vividly. There are quick and simple steps to keep a similar memory from being associated with your precious cooking. You go the extra mile to have quality greens, whether from your own garden or from the farmers’ market. Then you prepare those greens with specially chosen seasonings. There is no need to mess up the picture with a bit of grit hiding in those greens. Fill a large container half way with cool water. The largest size aluminum bowl is a good choice. Immerse your greens in the water and swirl them around for half a minute or so. Do swirl the greens but not so much as to bruise them. Lift the greens out of the bowl to a colander. Check the bottom of the bowl for grit. If there is any, repeat the process until there is no sand left in the bottom of the bowl. If you are using the greens in a salad, let the greens drip dry or use a salad spinner to dry them. Why Is Cleaning Greens Necessary? Many greens are savoyed or roughly textured leaving ample opportunity for bits of sandy soil to cling to the surfaces. 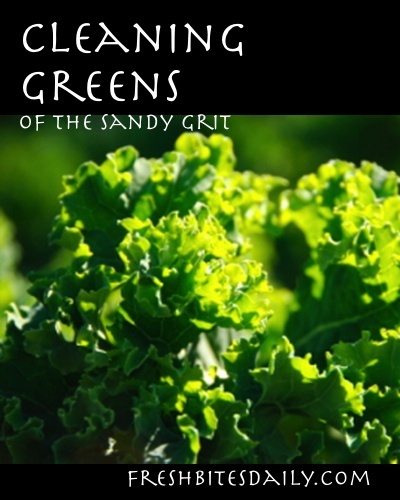 Greens are usually grown in sandy loam which means there will almost always be a bit of sand carried away with the crop. Simple rinsing does not do an adequate job of dislodging the more stubborn deposits of sand. Swishing in the bath water is the dislodging answer to this problem. A greens bath may seem like a lot of work initially, especially if you are accustomed to reaching into a bag of pre-washed greens from the grocery store. After a couple of rounds with this cleaning method, you will be an expert and think nothing of the few minutes it takes to ensure squeaky clean greens. 12 Comments on "Cleaning your garden greens"
Great tips! I once remember being served spring cabbage and gritty dirt – lovely! Nice sharing of tips..I will do this in our garden.. I do the same, but in one side of the sink (after cleaning it, of course). For especially dirty greens, like spinach is sometimes, I sometimes have to wash the greens two or three times. I used to work in a fast food restaurant and I noticed that they don’t thoroughly clean their food. I really like the tips you gave here. If only restaurants would wash greens that thoroughly. I usually soak my greens in water with salt too. And then rinse with clear water. I always use to clean the greens in Hot Water and clean it well but I like your tips and will definitely follow them. I stumbled here because mom wouldn’t answer the phone. I now know how to clean my greens thanks. I will continue to follow thank you. Thanks for the tips in thoroughly rinsing greens. I for one am for this practice because it pays to eat clean food. Nice tips. I usually don’t do this but thinking about it now that you mention it. Just lazy about washing everything off I guess. I have just been doing it in the kitchen sink before preparing the veggies. you’re right the veggies are much nicer clean and well cooked (unless it’s a salad) I normally just run them under a tap but this sounds much better plan. There is nothing more disgusting to think you have cleaned your veggies thoroughly and then see a snail or something else in it. It cannot be stated enough that you need to clean it!